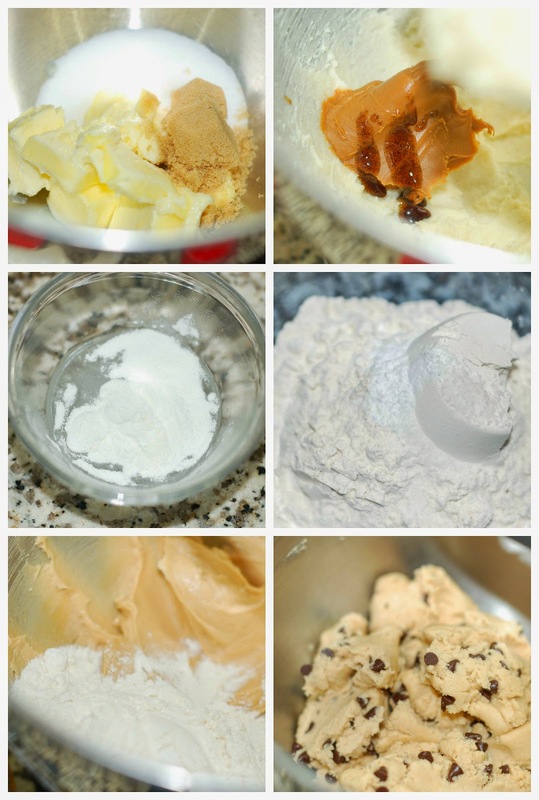 Even if you don't want to make the flower pops, you can still make regular round pops or truffles with this cookie dough recipe. I think I like it even more than the plain cookie dough recipe I used for my Cookie Dough Bunny Truffles. I use Wilton's meringue powder as my egg replacer, so these are egg free and totally edible raw. The dough is not heavy. It doesn't feel a ton of bricks. It light, fluffy and oh so good. 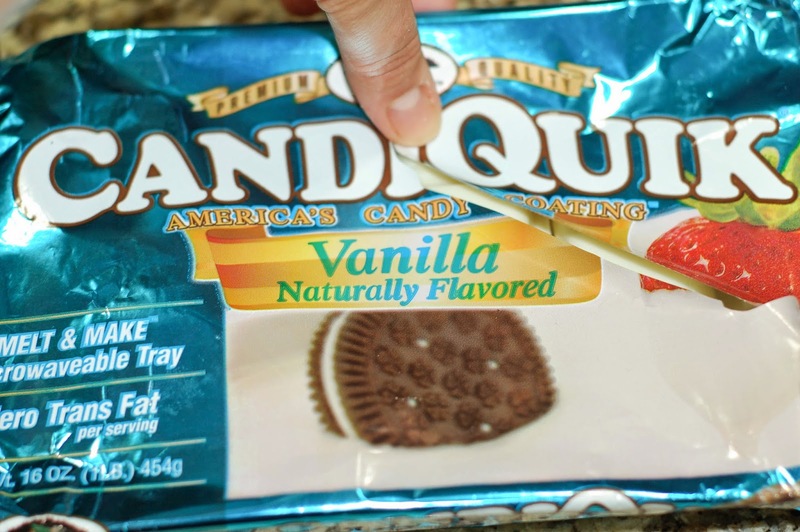 You get the flavor of Biscoff, but less sweet. I love to bake with Biscoff, but by itself it's sometimes a little too sweet. 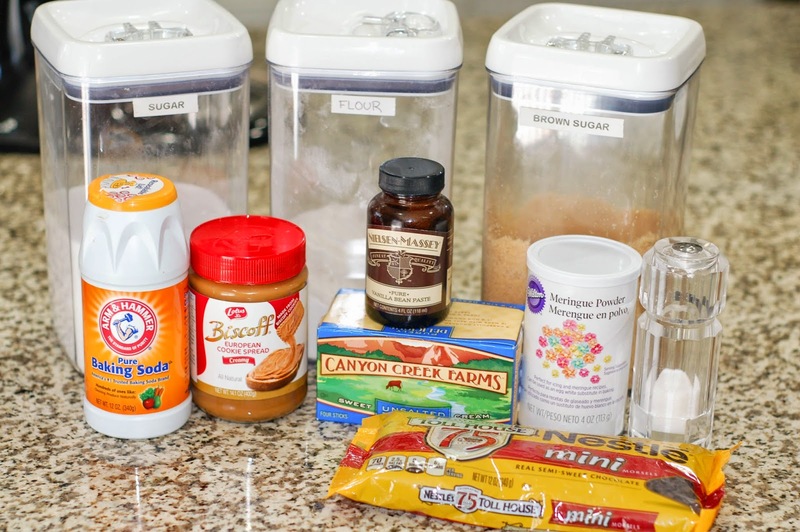 In this recipe I substituted some of the sugars for Biscoff so the sweetness is reduced. 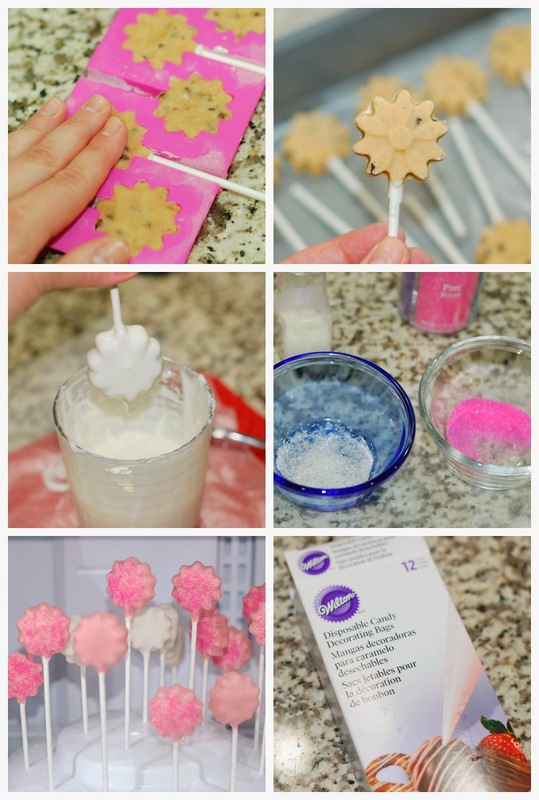 You could just grab a spoon and eat the whole bowl while watching tv or you can make some pretty flower pops like I did. I bought these silicone lollipop molds at Walmart during the Easter season. Each pack came with 2 mold of 6 pops each with space to add a lollipop sticks which were included. 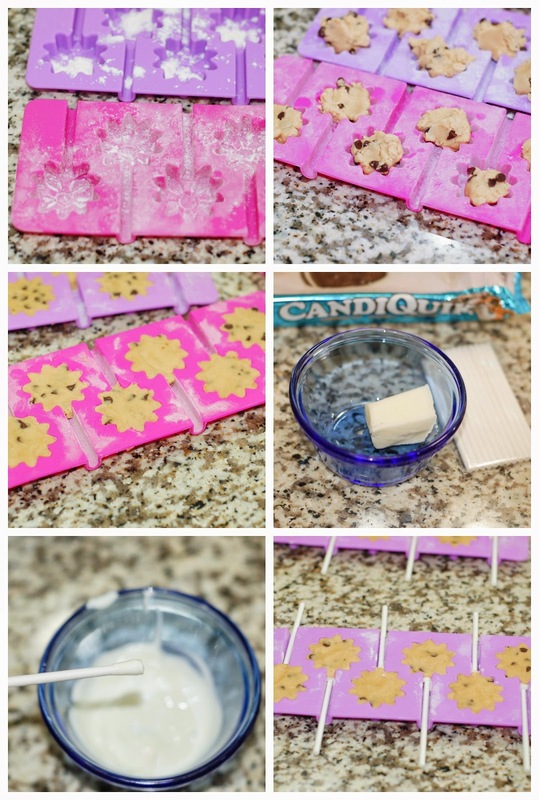 I don't make candy lollipops, but I knew I could use it to make cookie dough pops. I just sprinkled some flour into the molds and shook out any excess. Then took a bit of dough and started pressing it into the molds until it was flush. To add the sticks, I first dipped them in some melted candy coating and then pushed them into place while placing my hand over the dough so the stick would go in straight. After that, it was time to pop them in the freezer. The first batch I left in there 4 hours because I was busy with other stuff, but the Bunny Truffles I had only placed in the freezer for a 1/2 hour and they were firm enough to remove from the mold. I all depends on how cold your freezer is. You have to stretch and tug the silicone to loosen the pops. They came out great. Then it was time for dipping and decorating. You have to bring out only a few at a time from the freezer so the dough stays firm. My kitchen was very hot yesterday, so I had to be careful because once the dough softened up too much it fell off the stick. Also make sure your candy melt is not too hot. These are the three colors I used, but there are lots of different colors available. I also added some colored sugar crystals which I had in the pantry, to some of the pops. 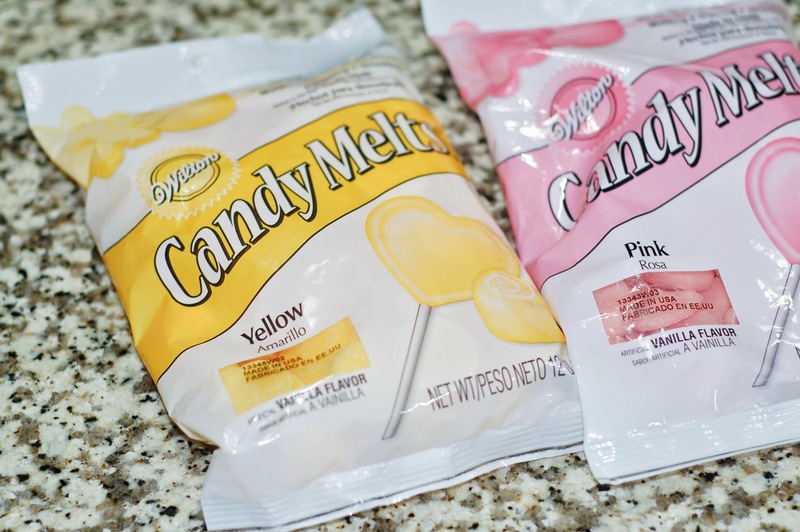 You add the crystals before the candy melt fully sets. Once the candy melt was set, I used a disposable candy decorating bag to pipe on the centers. Usually the candy melt sets fast, but like I said my kitchen was a little warm yesterday so I ended up having to place all my pops in the fridge to get the coating to harden. The weather here has been brutal this week. I also though of using pastel M&Ms for the centers, but I didn't have any on hand. To give the flower pops a little more special treatment I placed them in cupcake. 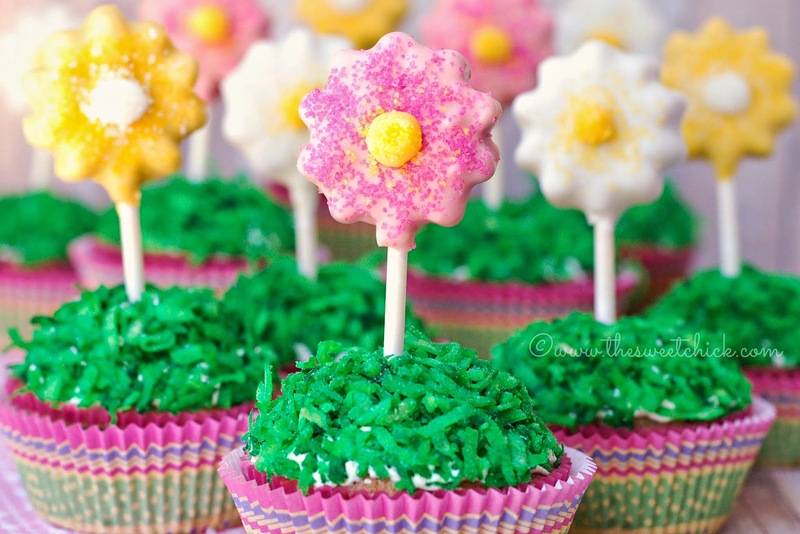 You can make any cupcakes you want and add some green frosting, then tint some coconut flakes with some green dye to make it look like grass and adhere them to the frosting. 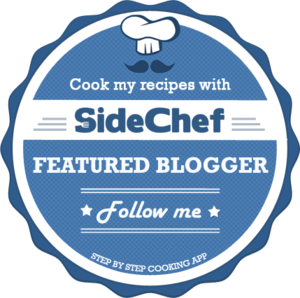 Just place the coconut flakes in a Ziplock bag, add some food coloring and shake it up. This is something the kids can do. 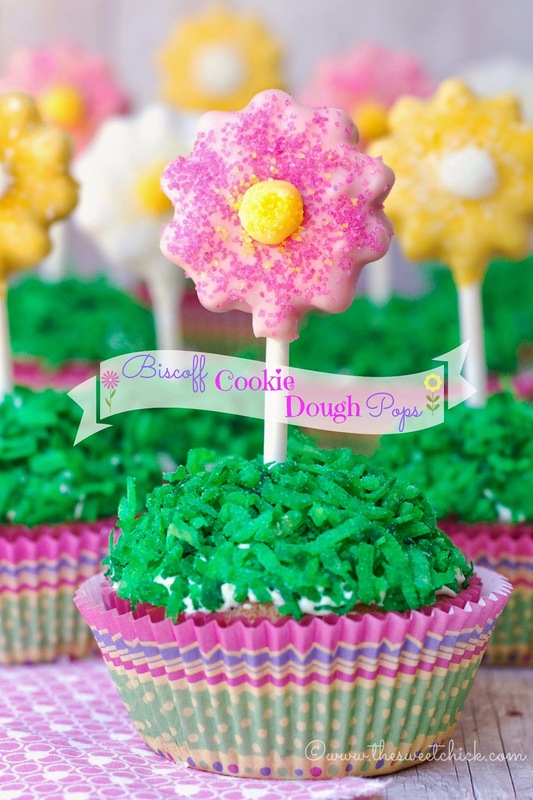 Or if you want you can just make the pops and maybe add a cute paper leaf to the lollipop stick with a message. Whatever you do, enjoy your pops and make sure to share! Once all the candy melt has set, you really don't need to keep these pops refrigerated. Remember there are not eggs involved. Just keep them in an airtight container. Love it! Perfect for a party! These are so cute! I saw those exact mold, picked them up, then thought "what would I ever use those for?" Dang it...I put them back. I am sure any mom would love to get these for Mother's Day. I also love Biscotti, but it is a little on the sweet side for sure. Thank you for linking up at Party in Your PJs. 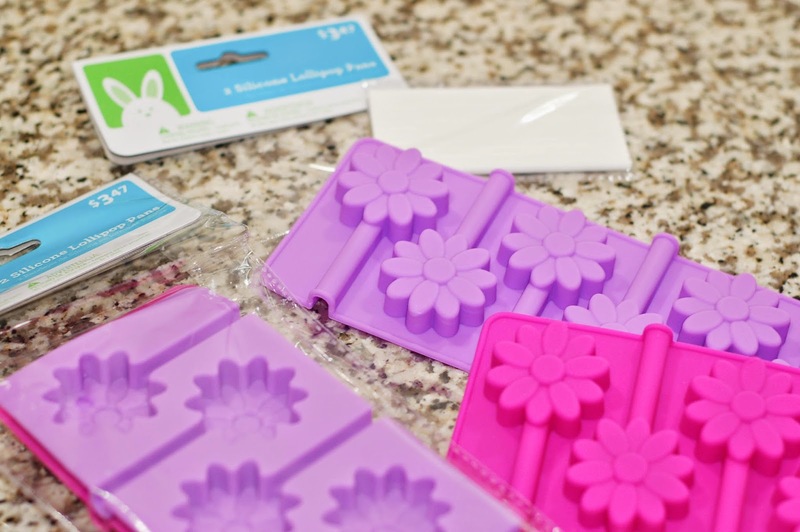 Silicone molds are great for lots of stuff! Very cute!! And biscoff anything is one of my favorites! !